Presto ... for public places. French tapware specialist Presto showcased its latest solutions for public places such as mosques and healthcare facilities at last month’s Big 5 show in Dubai, UAE. These included the Prestogreen range, the Presto 504 with a 150-mm projection, the SO’O wash basin mixer tap, the 1000XL DVA dual volume direct flush valve, and the MasterMix shower thermostatic mixer tap. The Prestogreen range is fully in line with environmental approaches such as the HQE (Haute Qualité Environnementale), Leed (Leadership in Energy and Environmental Design) and BREEAM (Building Research Establishment Environmental Assessment Methodology) green building standards. “Prestogreen offers more water savings thereby guaranteeing more credits,” says a company spokesman. Prestogreen provides increased water savings by reducing the flow time to seven seconds, combining comfort and savings; or through a water flow at 1.9 litres per minute that is achieved by “spray effect” aerators which ensure maximum ease of use and an optimum jet pressure quality for such a low flow rate and which can be interchanged with all types of taps. Available on a large portion of Presto wash basin taps, the Prestogreen range includes mechanical time-delayed taps such as Presto 500, Presto 600, Presto 2000 and Presto 4000 S; New Touch sensitive tap; and Volta electronic tap. The Presto 504 with a 150-mm projection is engineered to lend convenience and comfort to ablutions in places of worship. It helps save significant amounts of water through a constant flow rate of 3 litres per minute (four flow positions) and a flow time of 15 seconds (automatic interruption of water flow when the time has elapsed), he explains. 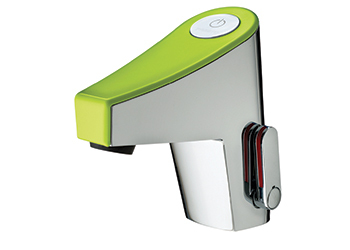 The SO’O wash basin mixer tap from Presto’s electronic tap range delivers an adequate amount of water by detecting the user’s hand, ensuring hygiene without having to touch the tap. It features an anti-overflow safety system that is triggered if the cell is obstructed as well as an anti-scalding safety system that limits the mixed water temperature to the required value. Meanwhile, the 1000XL DVA dual volume direct flush valve allows water saving of up to 90 per cent compared to a conventional flush, thanks to its two independent adjustable water volumes. Its design is not only hygienic but also safe and efficient: water is always available and the two flow rates are constant regardless of water pressure variations (between 1 and 4 bar). Lastly, MasterMix is a shower thermostatic mixer tap from the Sanifirst brand that is especially suited to healthcare institutions. It offers the advantage of no cross-connection between hot water and cold water (no check valve), thereby limiting the risks of bacterial proliferation and an anti-scalding safety system.